It will be nice to be able to walk across my lawn without damaging it, if even for a single day. Right now it is so sodden, it is like walking on pudding. I'm very hopeful the snow melts off my wood pile today as I've got work to do. Turkey day will be very cold. Stupid cold. And Wednesday night will be "squally" (never well represented by models) for Ridge and Valley west which should be fun to watch as the front of your nose freezes. Here could see low 20s for a high on Thursday. That is especially remarkable considering it may be under sunshine and little snow cover. I know the sun angle is low at this time of year, but still. I have never seen the ground so saturated where I am during a fall season. 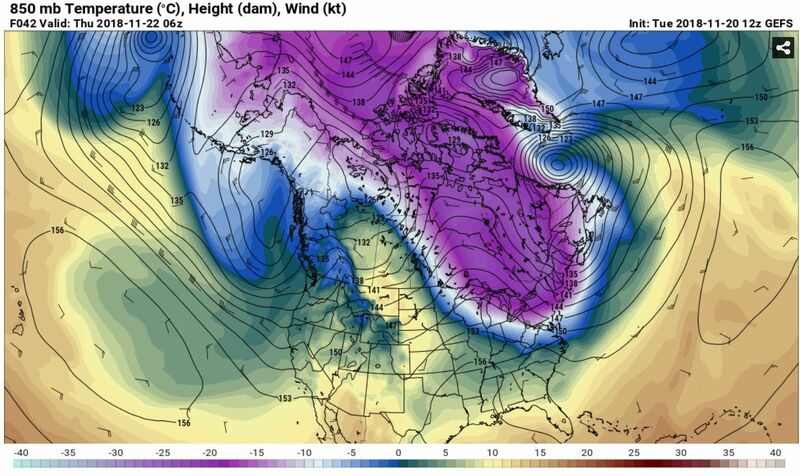 never forecasted an airmass that cold at 850 mb based on reanalysis. lower to middle teens on the coastal plain. portions of the interior high terrain to between 20 and 25 on the coastal plain. Thanksgiving morning for much of the region! differential is extreme with a greater than 30C differential! winds begin to turn more NNW. How the airmass will look Thanksgiving morning. From the Arctic to the Northeast. With a low pressure system off the East coast strengthening and moving off to the Northeast, precipitation associated with the low will swing inland. As a result, snow will continue to fall across the White Mountain Region during the overnight hours and into Wednesday morning. Snow accumulations will remain fairly low, and will likely diminish into upslope snow showers as the morning progresses on Wednesday. Wind speeds will be on the rise as well, prompting a Wind Chill Advisory that will go into effect at 3 am tonight. Following the passage of the coastal low, a strong cold frontal boundary will swing through from the Great Lakes and potentially bring another round of frozen precipitation. Passing through the forecast area headed into Wednesday evening, temperatures will plummet well below freezing, with wind speeds increasing drastically in the front’s wake. Wednesday night will see winds gusting into the 100 mph range as temperatures fall to around 15 below, putting wind chills between 60-70 degrees below and drastically increasing risk for hypothermia or frost bite. This frigid pattern will likely persist into the day on Thursday, allowing for the possibility for several daily record low temperatures to be broken. With wind speeds forecasted to increase further as temperatures drop several more degrees, a wind chill warning will go into effect at 7 pm Wednesday evening that will last through the remainder of the forecast period. NAM and RDPS continue to show blisteringly cold windchills for Thursday morning. Kind of wonder what that feels like but I don't want to find out. Does that make sense? Front should be through within the next few hours..
Squall line getting ready to move through, 4.5” overnight..
* Until 1015 AM EST. State Park, moving south at 20 mph. gusts greater than 35 mph. East Rochester, Hilton and Webster. Lightning strikes just to my north.. Wondering if this holds together or dries up. I'm pretty sure the squall associated with the cold front will hold together, but should gradually weaken as it moves farther from the lakes. High-res models suggest the pre-frontal snows will struggle to leave the state of NY. Verbiage out of state college sounding like they're expecting a decent snow squall to come through. Short range models hinting at this as well. If only we would've known that it would be this cold for the NE on Thanksgiving. Squall line out in front, looks to make it down to the coast with rain showers going quickly over to flurries. Tannersville, Long Pond, Kresgeville and Sun Valley. -10C line should get as far south as Baltimore. Thats pretty much the Arctic front. Hope hikers are prepared. What an airmass to look at and experience in November. I never have. We never have. plenty of sites to see the current 850mb temps. Looking at a high of 10F tomorrow.